In a previous post, I wrote about how discriminators are the federal contractor’s version of the Black Friday sale. 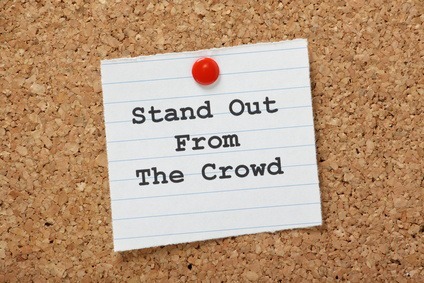 What makes your company special? Do your people have special training or experience? Do you have specialized equipment? Do you have specific industry insights? Once you have a clear handle on what distinguishes you from your competitors, it’s time to tell the world so that the right customers find you, and other people know exactly who to refer to you. Consistent marketing messages – Before you put anything out to the public, be clear about how and what you want to project. Come up with specific words and phrases for your core messages – how you will describe your discriminators. Then make sure these phrases are used in all of the following marketing materials and conversations. Trade shows – Investing in a trade show booth is your chance to display your core marketing messages and have preliminary conversations with the people who are drawn to your display. TAPE Director of Corporate Marketing and Communications Daria Gray shared some excellent tips for setting up a successful trade show booth. Blogging – By writing about your company’s capabilities and other relevant topics in your industry, you and your team can establish your thought leadership and give more insight into your areas of expertise. After you’ve met people initially, you can send them links to blog posts that relate to your conversation. Events – Whether you’re at the podium, in the audience, on the tradeshow floor, or even walking down the hallways, always be ready to make a meaningful connection with a customer, referral source, or potential teaming partner. Most importantly, be willing to follow up with the new contacts you’ve made, both directly (e.g., scheduling a meeting) and indirectly (e.g., asking permission to add the person to your newsletter list). Social media – Social media is an excellent way to follow up with people you’ve met, maintain an ongoing relationship, and gain access to valuable new contacts. Identify your key contacts and watch for updates you can reply to, “like,” or share you’re your own networks. These seemingly small actions can do wonders for keeping you on their minds and reminding them who you are and what you do. Be sure that your social media profile pages have the same consistent messaging as your other marketing materials. In the quest for new business, always be telling a clear and consistent story of who your company is and who and how you help. Those are the discriminators that lead someone to choose you over a competitor.